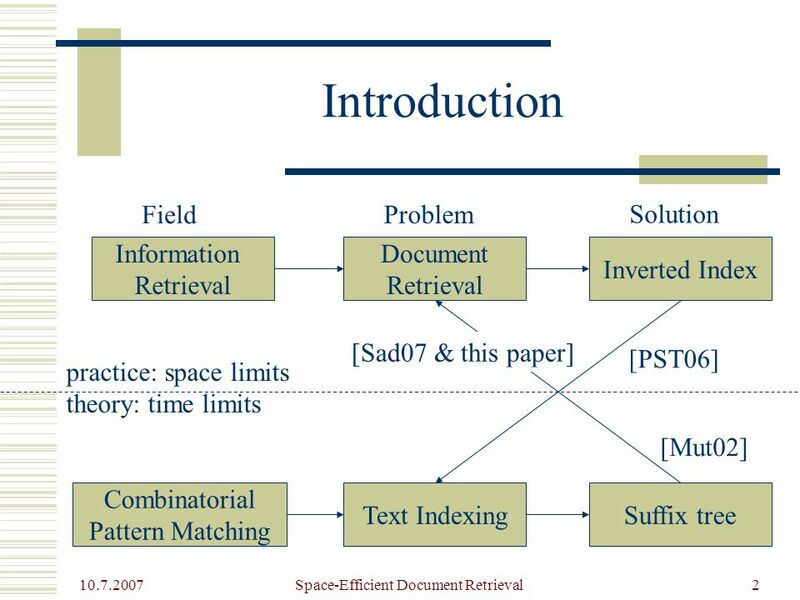 3 10.7.2007 Space-Efficient Document Retrieval3 Text Indexing  Let T = t 1 t 2... t n be a text string from an ordered alphabet Σ. 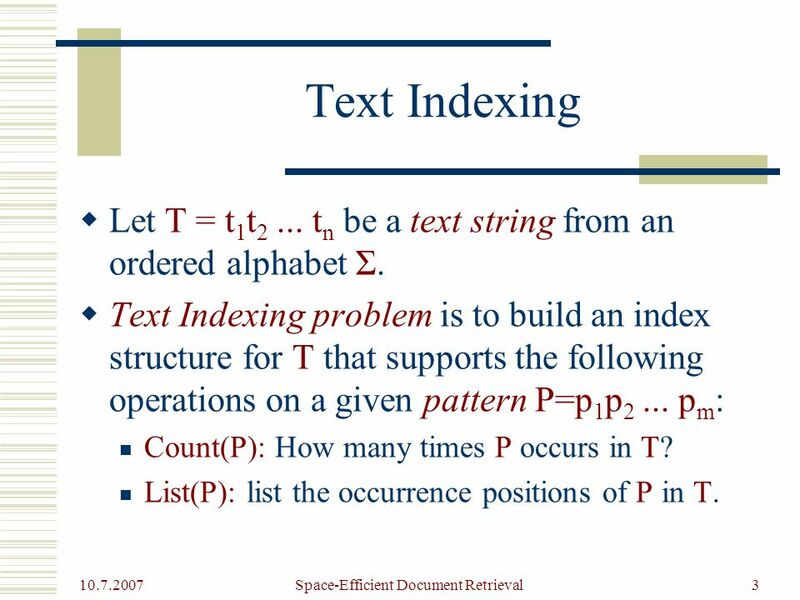  Text Indexing problem is to build an index structure for T that supports the following operations on a given pattern P=p 1 p 2... p m : Count(P): How many times P occurs in T? 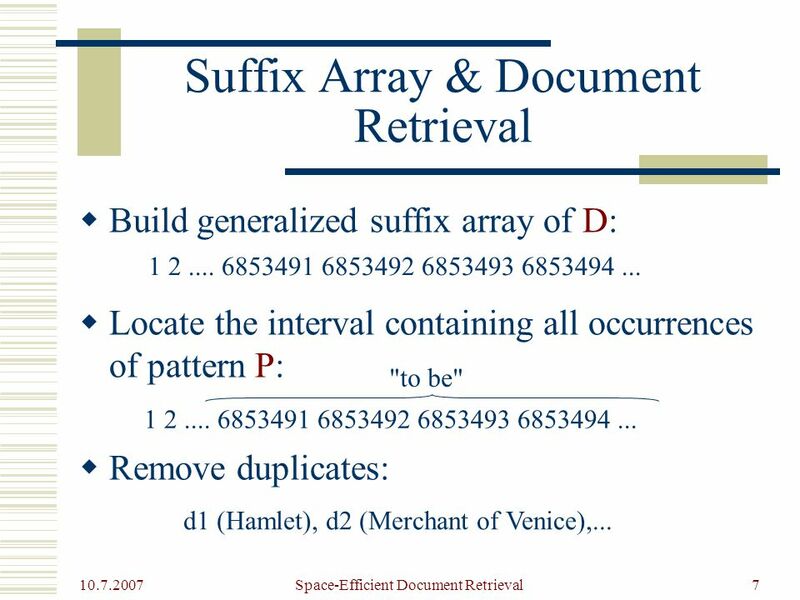 List(P): list the occurrence positions of P in T.
6 10.7.2007 Space-Efficient Document Retrieval6 Suffix Array & Document Retrieval (1/2)  Build generalized suffix array of D: 1 2.... 6853491 6853492 6853493 6853494... To be, or not to be: that is the question: Whether 'tis nobler in the mind to suffer The slings and arrows of outrageous fortune, Or to take arms against a sea of troubles, And by opposing end them? To die: to sleep; PORTIA: If to do were as easy as to know what were good to do, chapels had been churches and poor men's cottages princes' palaces. It is a good divine that follows his own instructions: I can easier teach twenty what were good to be done, than be one of the twenty to follow mine own teaching. 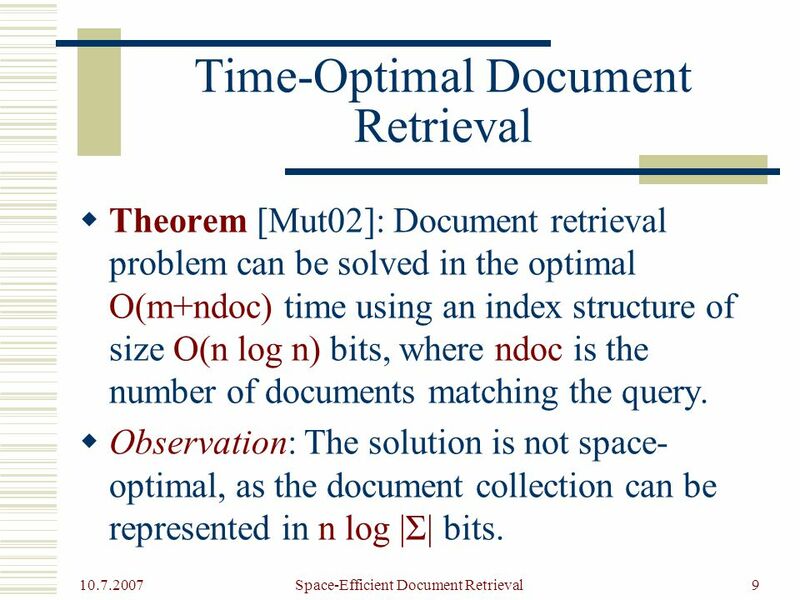 9 10.7.2007 Space-Efficient Document Retrieval9 Time-Optimal Document Retrieval  Theorem [Mut02]: Document retrieval problem can be solved in the optimal O(m+ndoc) time using an index structure of size O(n log n) bits, where ndoc is the number of documents matching the query. 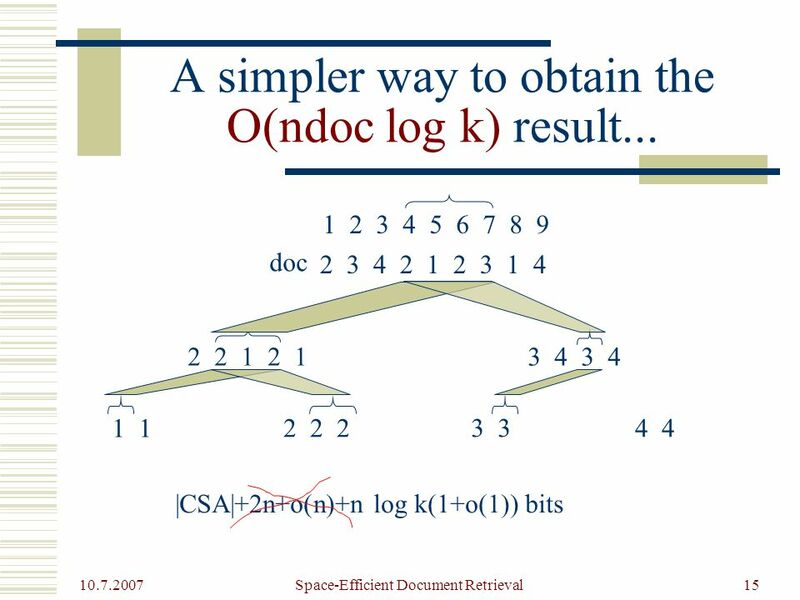  Observation: The solution is not space- optimal, as the document collection can be represented in n log |Σ| bits. 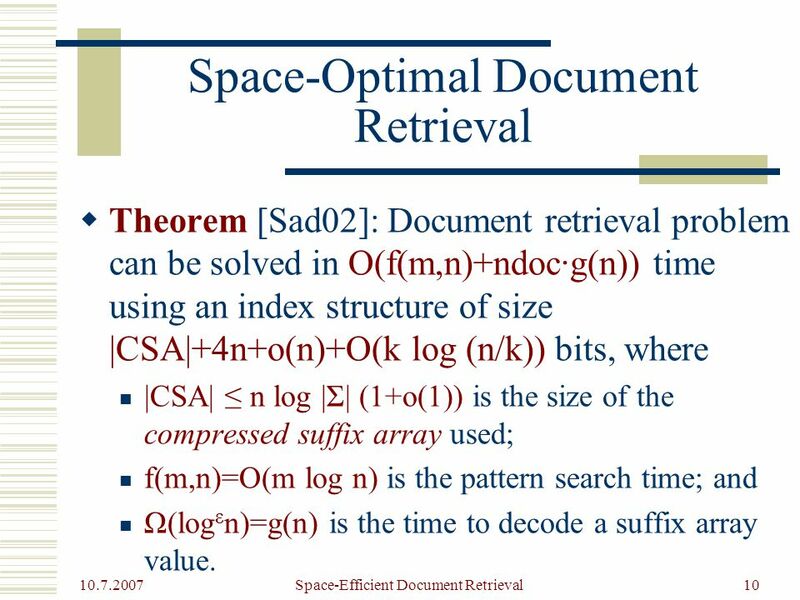 10 10.7.2007 Space-Efficient Document Retrieval10 Space-Optimal Document Retrieval  Theorem [Sad02]: Document retrieval problem can be solved in O(f(m,n)+ndoc·g(n)) time using an index structure of size |CSA|+4n+o(n)+O(k log (n/k)) bits, where |CSA| ≤ n log |Σ| (1+o(1)) is the size of the compressed suffix array used; f(m,n)=O(m log n) is the pattern search time; and Ω(log ε n)=g(n) is the time to decode a suffix array value. 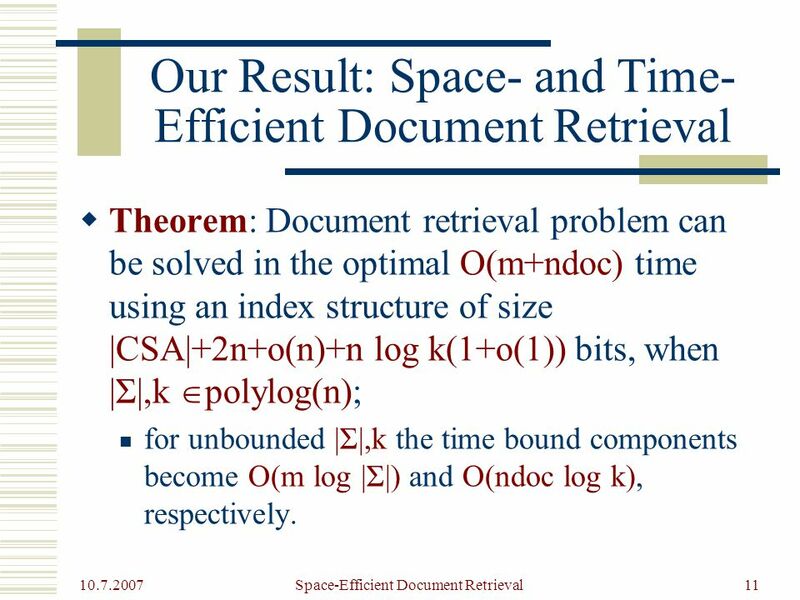 11 10.7.2007 Space-Efficient Document Retrieval11 Our Result: Space- and Time- Efficient Document Retrieval  Theorem: Document retrieval problem can be solved in the optimal O(m+ndoc) time using an index structure of size |CSA|+2n+o(n)+n log k(1+o(1)) bits, when |Σ|,k  polylog(n); for unbounded |Σ|,k the time bound components become O(m log |Σ|) and O(ndoc log k), respectively. 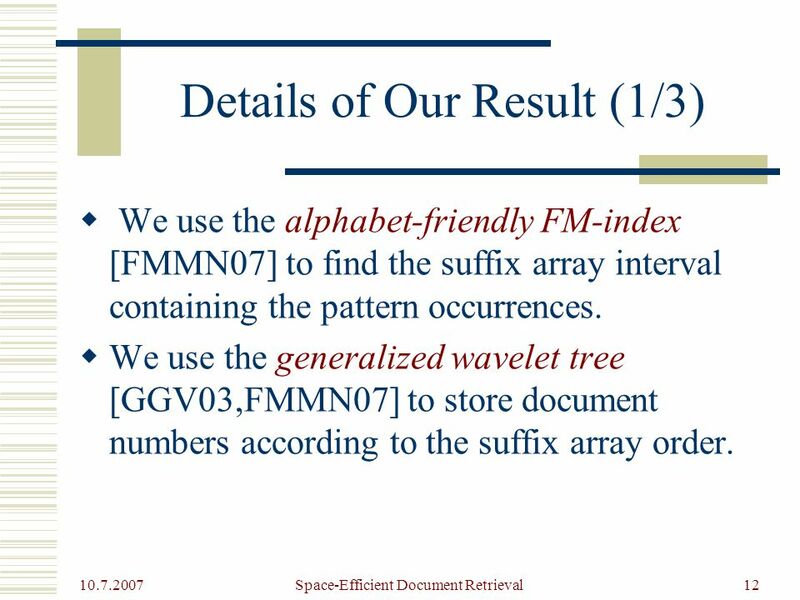 12 10.7.2007 Space-Efficient Document Retrieval12 Details of Our Result (1/3)  We use the alphabet-friendly FM-index [FMMN07] to find the suffix array interval containing the pattern occurrences.  We use the generalized wavelet tree [GGV03,FMMN07] to store document numbers according to the suffix array order. 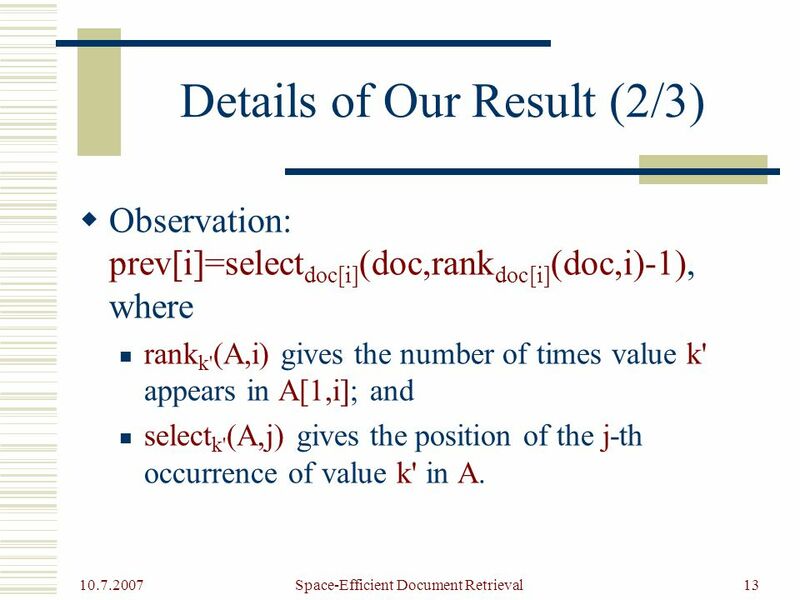 13 10.7.2007 Space-Efficient Document Retrieval13 Details of Our Result (2/3)  Observation: prev[i]=select doc[i] (doc,rank doc[i] (doc,i)-1), where rank k' (A,i) gives the number of times value k' appears in A[1,i]; and select k' (A,j) gives the position of the j-th occurrence of value k' in A. 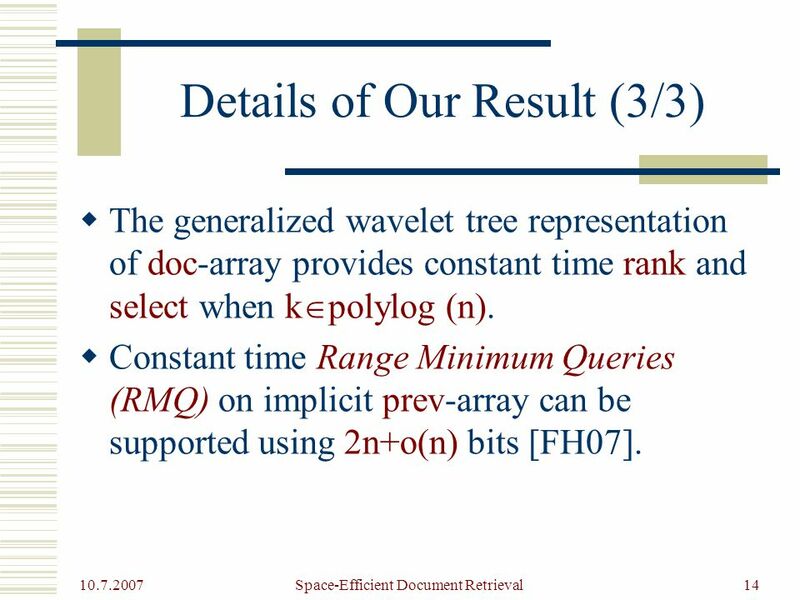 14 10.7.2007 Space-Efficient Document Retrieval14 Details of Our Result (3/3)  The generalized wavelet tree representation of doc-array provides constant time rank and select when k  polylog (n).  Constant time Range Minimum Queries (RMQ) on implicit prev-array can be supported using 2n+o(n) bits [FH07]. 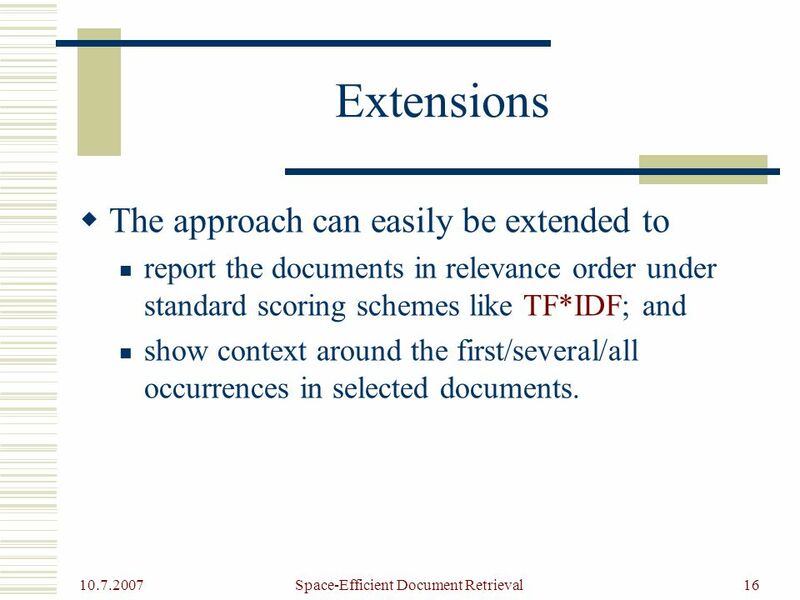 16 10.7.2007 Space-Efficient Document Retrieval16 Extensions  The approach can easily be extended to report the documents in relevance order under standard scoring schemes like TF*IDF; and show context around the first/several/all occurrences in selected documents. 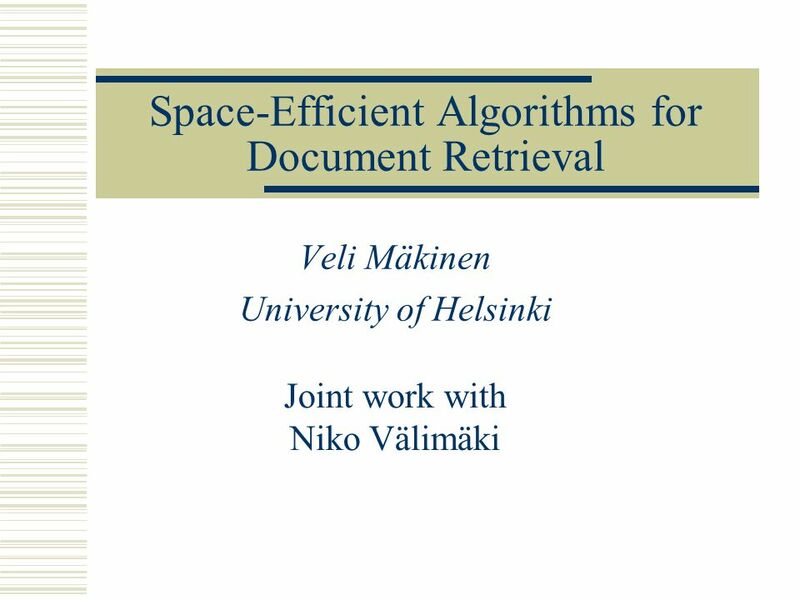 Download ppt "Space-Efficient Algorithms for Document Retrieval Veli Mäkinen University of Helsinki Joint work with Niko Välimäki." Introduction to Information Retrieval Introduction to Information Retrieval Lecture 7: Scoring and results assembly. Succinct Representations of Dynamic Strings Meng He and J. Ian Munro University of Waterloo. Indexing. 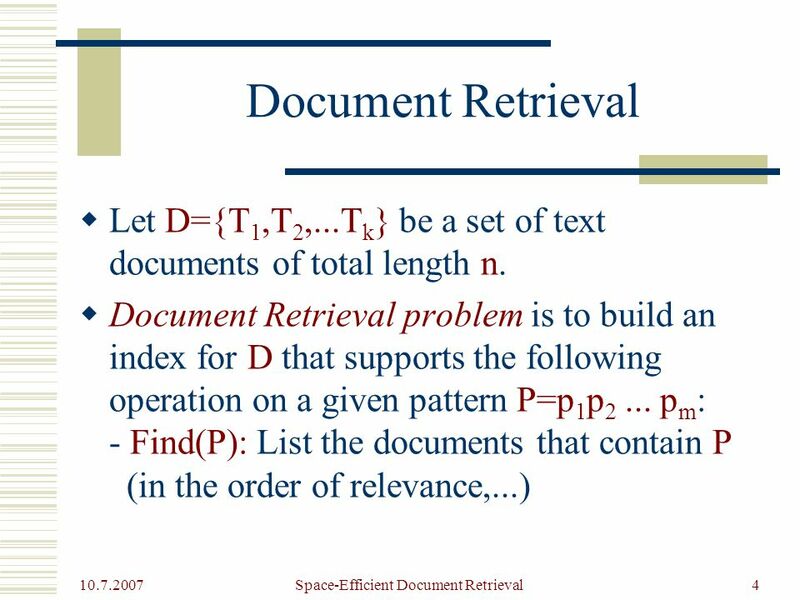 Efficient Retrieval Documents x terms matrix t 1 t 2... t j... t m nf d 1 w 11 w w 1j... w 1m 1/|d 1 | d 2 w 21 w w 2j... w 2m 1/|d. Pete Bohman Adam Kunk.  Introduction  Related Work  System Overview  Indexing Scheme  Ranking  Evaluation  Conclusion. Intelligent Information Retrieval 1 Vector Space Model for IR: Implementation Notes CSC 575 Intelligent Information Retrieval These notes are based, in. 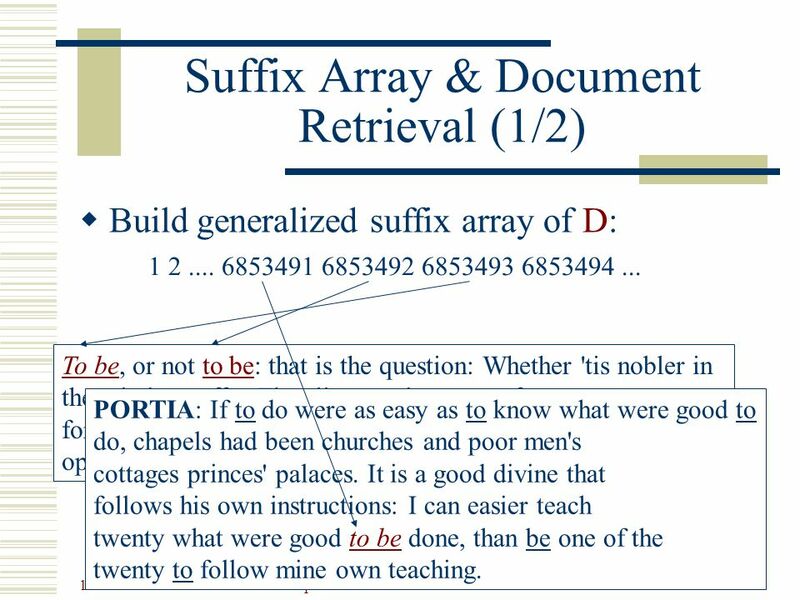 Compressed Compact Suffix Arrays Veli Mäkinen University of Helsinki Gonzalo Navarro University of Chile compact compress. A Categorization Theorem on Suffix Arrays with Applications to Space Efficient Text Indexes Meng He, J. Ian Munro, and S. Srinivasa Rao University of Waterloo. © 2004 Goodrich, Tamassia Tries1. © 2004 Goodrich, Tamassia Tries2 Preprocessing Strings Preprocessing the pattern speeds up pattern matching queries. Tries Standard Tries Compressed Tries Suffix Tries. 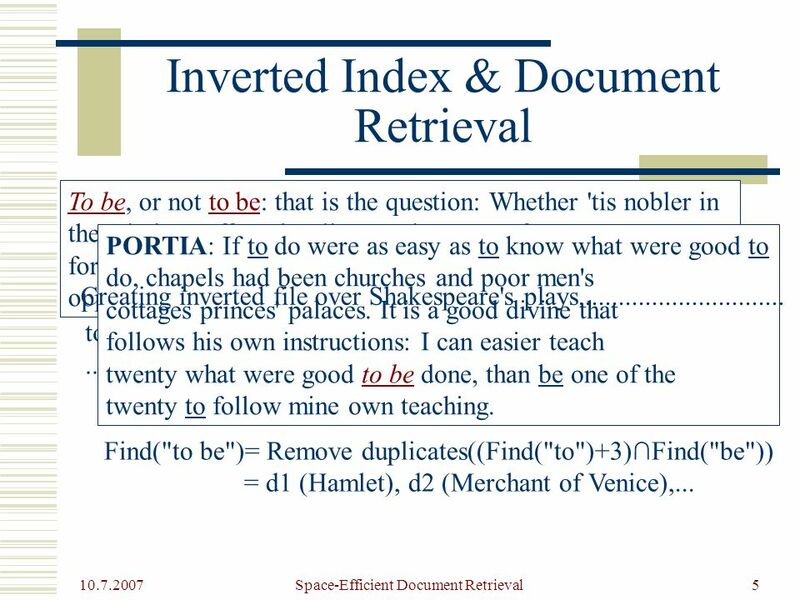 Modern Information Retrieval Chapter 8 Indexing and Searching. Wavelet Trees Ankur Gupta Butler University. Text Dictionary Problem The input is a text T drawn from an alphabet Σ. We want to support the following. Packing bag-of-features ICCV 2009 Herv´e J´egou Matthijs Douze Cordelia Schmid INRIA. 1 Query Languages. 2 Boolean Queries Keywords combined with Boolean operators: –OR: (e 1 OR e 2 ) –AND: (e 1 AND e 2 ) –BUT: (e 1 BUT e 2 ) Satisfy e.
1 CS 430: Information Discovery Lecture 4 Files Structures for Inverted Files.